A string trimmer may end up being the most versatile lawn care tool you have in your garage. These trimmers feature a plastic line that swirls around in a circular pattern at speeds as much as 400 mph. The tool is ideal for trimming grass around trees, steps and rocks and great for establishing and maintaining a neat edge along the walkway, driveway, and the garden. It can even be used as an alternative to a lawn mower to cut grass on a rocky hillside that is too uneven to mow. The string comes already wrapped around the head of the trimmer. Keep in mind that it slowly deteriorates over time. Some heads release more string automatically while others require you to tap the head on the ground when you need more string. Over time the spool will empty and you are going to have to wrap new string around the head. There are also trimmers that feature a steel blade rather than string. These trimmers are ideal for more heavy-duty work. Many landscape contractors actually keep two trimmers –- a blade and a string –- so that they can handle light and heavy-duty cutting. Strings are available in an assortment of thicknesses and textures, but typically you are stuck using the style of string the trimmer accepts. There are two types of string trimmers –- gas powered and electric. 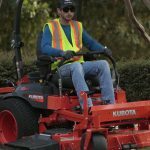 The gas-powered trimmers feature either a 2-cycle or 4-cycle engine. Electric trimmers are available with a cord or are cordless. Determining which style to use depends on the size and terrain of your property and whether or not you can tolerate a lot of noise and pollution. 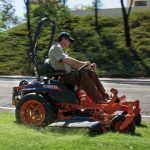 Gas-powered trimmers have the power to handle big yards with a cutting band of 16-inches to 18-inches. However, they are heavier than the electric models and generate noise and pollution. More maintenance is required and you need to keep a sufficient amount of gas and oil in the garage. As mentioned, gas-powered trimmers come with either a two-cycle or four-cycle engine. The two-cycle has the power to clean up a large yard. Landscape contractors suggest that if you decide to get a two-cycle trimmer, make certain it features separate primer, chock and throttle controls so you don’t experience start issues. Also keep in mind that two-cycle engines work on a mixture of gas and oil. If you have a heavy-duty clean up of a large yard to attack, then you would probably want a four-cycle engine trimmer. They are easier to start, quieter, less of a polluter and smoother running than the two-cycle variety. Moreover, this machine doesn’t require a gas-oil mixture. As mentioned, the electric string trimmer is lighter, offers less noise and is less expensive than the gas-powered string trimmer. However, it has less power. And depending on whether you select a corded electric trimmer or a cordless trimmer there will be limits to the areas you can work or you have to deal with battery life. 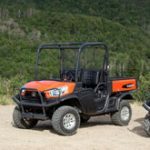 In addition, the electric trimmer has a smaller cutting band of 12-inches to 15-inches and it is not powerful enough to handle brush cutting. Electric trimmers with a cord offer about 3-amps of power, which is enough to clean a typical suburban yard as long as you have access to outdoor electrical outlets. You might be able to obtain a long extension cord so that you can work in a little larger area. A corded electric trimmer is probably the least expensive of all trimmers. Battery-powered trimmers can deal with grass and weeds on a small year. 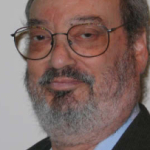 Obviously, there is no restrictions to how much area you can work and you don’t have to deal with gas-oil mixtures. It is advised that you keep an extra battery pack so there is no down time when the battery being used runs down. What Is Topiary and How Do You Do It?